On New Year’s Eve, we discovered round trip airfare in mid-April from Newark International to Milan, Italy for about $500 per person, so we booked the tickets without an actual travel plan. We just knew we wanted to go to Italy in April. When March arrived, it was time to begin planning our trip in earnest. A few years ago, we spent a very enjoyable week in Milan and wanted to revisit the city; however, we also wanted to see more of Italy. Since we were flying into Milan in the north, we researched Lake Como and Venice which are relatively nearby via train. But we’d also heard about the Amalfi coast and, after a long winter in Colorado, were ready for some sun and the ocean. For several full days I read hotel and restaurant reviews on Trip Advisor and prepared a spreadsheet with options and estimated costs for each possible destination within Italy. After much research on the internet and watching several travel shows on Italy (Rick Steves and Rudy Maxa), we finally settled on spending most of our 10 day vacation in Sorrento. Flying to Rome or Naples would have been logistically better, but we decided a high-speed train ride across the country would be fun. The last few days of the trip would be spent in Milan revisiting the city we previously enjoyed so much. Initially, we had thought we could visit more locations, but several experienced friends warned us we were just trying to see too much in one trip. I’m very glad I listened to their advice. After all, one very important goal of this vacation was simply to relax. One additional aspect of the trip was the requirement to get from Denver to Newark International for our bargain priced flight across the ocean. The $500 fare didn’t include our first and last legs of travel within the U. S. In order to avoid any domestic flight delay problems, we decided to fly to New York the day before our flight to Milan and spend one night in Manhattan. Of course this additional flight, ground transportation and hotel expense was going to add some cost to our trip, but we enjoy visiting New York so we considered it to be a bonus extension to our travels. We found a reasonable and direct one-way flight to LaGuardia from Denver and also found the same type of flight for the return from Newark to Denver. For the return journey, we decided the risk of delay from Milan to Newark was probably minimal and we had several hours to get through customs and re-check bags domestically. We also decided if we missed our return flight to Denver, the worst that could happen would be spending another night in New York. Spring weather in Denver can be erratic and the likelihood of being suddenly walloped with a huge snowstorm is quite good. Three days before we were to fly to New York, a huge snowstorm was predicted to hit Denver! To be on the safe side, we bumped up our flight to LaGuardia by one day in order to get out ahead of the coming snow storm. We had booked the Park Central Hotel located a few blocks south of Central Park in Manhattan and, thankfully, they had availability for the extra night we needed. Sure enough, the day we flew to New York, the airport was jam packed with people trying to get out of Denver before the the storm arrived. Flights were overbooked and airlines were already cancelling flights for the next day, but we successfully managed to fly to New York a day ahead of schedule. 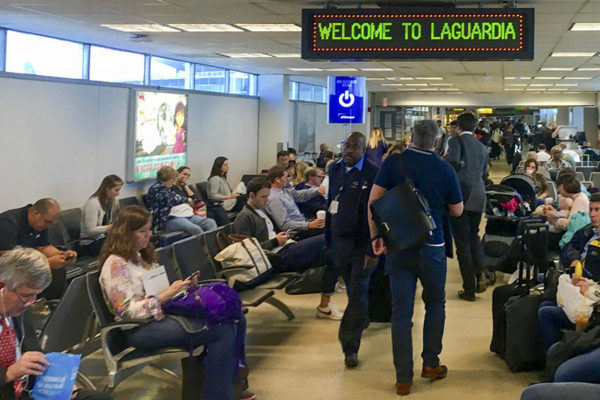 Uber and Lyft have raised prices quite a bit in the New York area and we quickly discovered upon arrival at LaGuardia that a taxi would provide a good balance of cost and convenience for transportation to our Manhattan hotel. The Park Central Hotel was well located on 7th Avenue across the street from Carnegie Hall. It’s a recently renovated property that’s well maintained with excellent customer service. We soon discovered that cocktails in New York hotel bars are now hitting the $20 mark after having two martinis on property shortly after arrival. 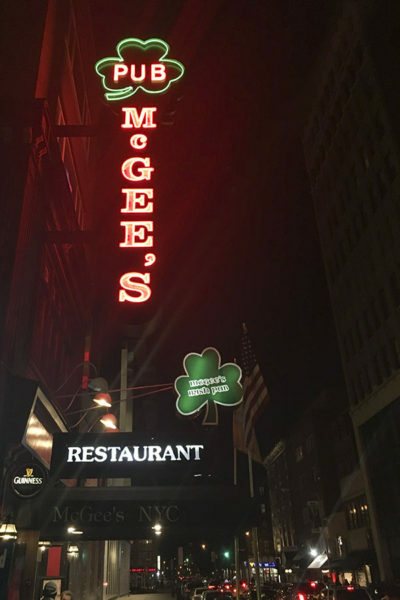 Tip: for reasonably priced cocktails in Manhattan, head to the nearest Irish Pub. After two enjoyable but more-expensive-than-expected nights in Manhattan, it was time to head to Newark International Airport for our flight to Milan. To save money, I decided we’d take the train from Penn Station to Newark International. By the time we arrived in Newark, I was sorely wishing we had paid for a taxi, Uber or Lyft car. The subway was difficult to navigate with heavy luggage and the train from Penn Station was so crowded we had to stand up in the aisles all the way to Newark. What’s more, it was a warm, humid day in New York and I was overheating and sweating like mad while scrambling through grabby turnstiles and cramped underground tunnels that made me slightly claustrophobic. After arriving at Newark International, check in and security were relatively quick and easy. More expensive martinis at a bar in the international terminal soothed nerves for the two to three hour wait for our flight to Milan. 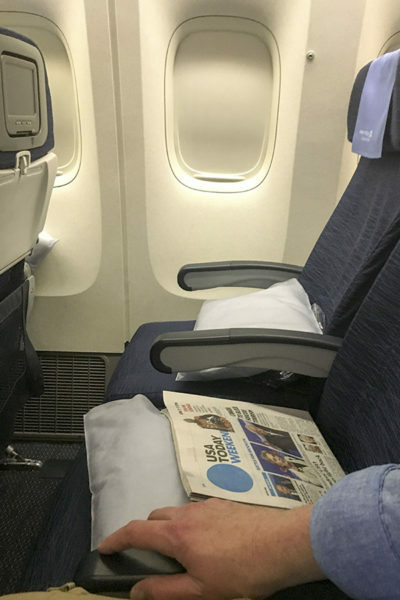 The overnight flight to Milan was uncrowded and pleasant even though I was unable to fall asleep overnight. Our early morning landing in Milan’s rurally located Malpensa airport coincided with several other arriving international flights, so the line at customs was rather long. We had decided to travel via high-speed train without stopping from Milan to Sorrento. A nineteen hour non-stop journey sounds ok until you’re half-way through it and want nothing more than to rest in a comfortable hotel room. Nonetheless, we journeyed on. 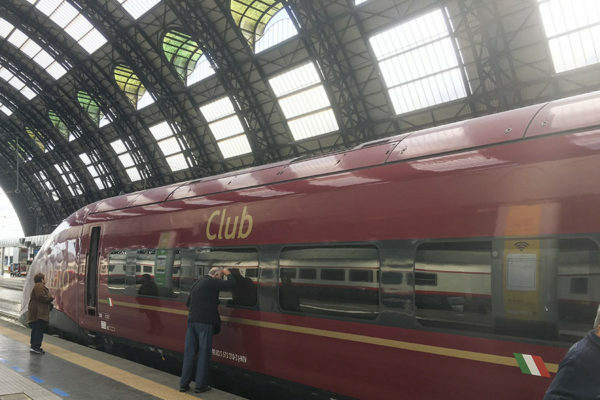 We took the Malpensa Express train from Malpensa Airport to Milano Centrale train station (about an hour’s ride) to avoid a 90 Euro cab fare. From there, we took a 5 ½ hour ride on the new Italo train to Naples. When we approached the ticketing area in Milano Centrale station, a young lady greeted us in front of an Italo ticket machine and assisted us in purchasing tickets. The only tickets still available were in the Club Car (another higher-than-expected expense), but we needed to get to Naples before the last ferry left for Sorrento. The Italo Club Car was supposed to be the best and most comfortable service available; however, we were less than impressed. The food and beverages offered us were strictly minimal and certainly not up to any Italian standard of quality. Additionally, we found the temperature on the train in the Club Car to be quite warm which only added to our travel tiredness. After finally arriving in Naples, we only had about 45 minutes to spare before the last boat of the day departed for Sorrento. 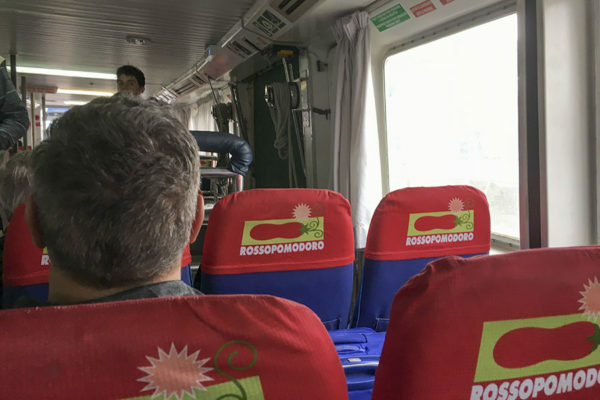 The other options for getting to Sorrento from Naples were hiring a private car or taking the horrible and slow Circumvesuviana regional train, which is well known for pick pocket thievery. We scrambled quickly off the train, hurried through the station out to the taxi area, and asked the first driver what the cost would be to take us to the boat dock. I had read that it is necessary to negotiate taxi fare in advance in Naples or exorbitant fares can be charged. The driver quoted us 15 Euros and we readily agreed. After a ride resembling Mr. Toad’s Wild Ride in real life through gritty Naples, we arrived at the port, secured our tickets quickly and awaited our boat ride to Sorrento. 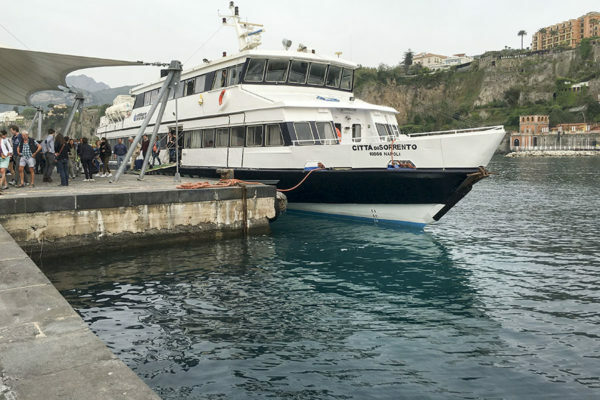 The ferry ride across the Bay of Naples to Sorrento took about 40 minutes and was pleasant; however, there’s not much to see since the windows are not really optimal for viewing scenery. The passenger area of the boat is fully enclosed and there are long rows of seats all facing forward. Taxis were readily available near the dock in Sorrento; however, even with asking the price in advance, the fare was 20 Euros for a four kilometer ride to our hotel. We were so exhausted from travel, I would have paid 50 Euros just to get to our hotel at that point. Despite being very tired, seeing beautiful Sorrento upon arrival seemed to immediately soothe my mind and ease my travel pains. Nineteen hours after departing Newark International, we arrived at our hotel just in time to quickly shower, change and enjoy a pre-dinner cocktail on a balcony overlooking the Bay of Naples and Mount Vesuvius. A very pleasant dinner was enjoyed at the Hotel Belair restaurant, followed by much needed sleep. 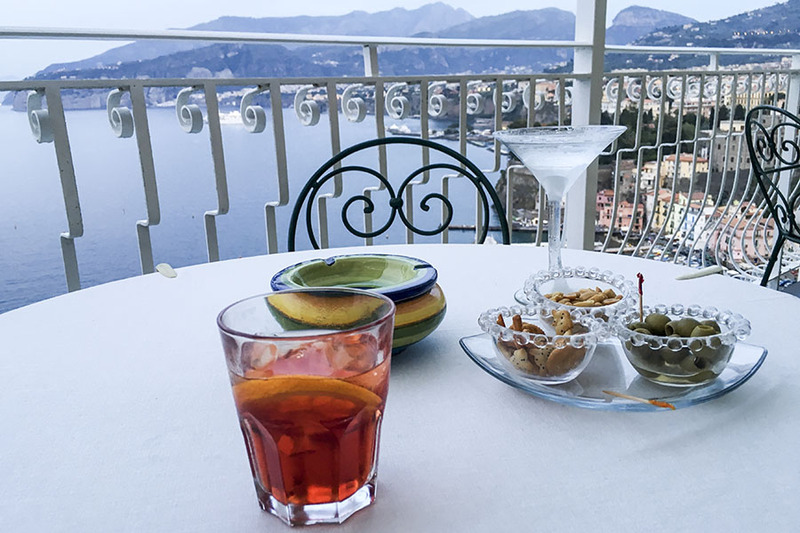 The next article in this series about Italy is Delicious Dining – Restaurants in Sorrento, Italy.